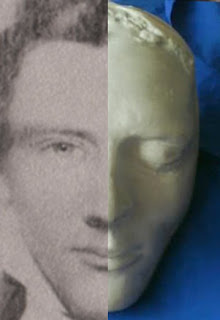 I thought that it would be interesting to do a side by side comparison of my Joseph Smith photo with his death mask. The only difference that stands out in this image is his nose, which I believe they stuffed with cotton prior to casting the mold. A personal thank you to Gracia Jones for allowing me to examine and photograph her mask. To those who don't know, Gracia Jones is a well known author, historian, and direct decedent of Joseph and Emma Smith. Very fascinating new update, sis. That mask is kind of eerie (but it definitely fits with the photograph). This is all very intriguing! I'm curious to hear what happens next!